Blade Operation | Technology behind the Power Dozer by Viking Power Dozer Ltd. 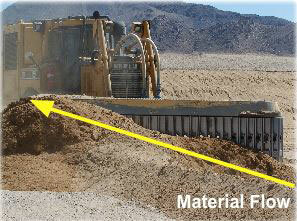 The Power Dozer acts as a conveyor belt, permitting simultaneous loading and unloading of material. Using hydraulics to move the earth away, the Power Dozer blade can push more material than it weighs. This is a limiting factor for conventional earth-moving equipment. The earth is moved in one lateral direction permitting the unit to handle very narrow rights-of-way. Using this technology no power is taken from the host platform allowing the total tractive effort to be applied to the ground producing continued forward motion while maintaining necessary depth. In practical terms, the Power Dozer blade moves more material per horsepower/ hour. The Power Dozer side casting blade consists of a standard cutting edge, with or without teeth, a steel track laid on edge to form a belt around two vertical axes. Its unique design features a steel belt driven by two separate high-torque, low-speed hydraulic motors powered by an auxiliary diesel engine mounted on the rear of the dozer. The design features of the Power Dozer blade make it ideal for any type of earth-moving job. SEE THE EASE OF OPERATION. Normal maintenance is minimal (similar to conventional dozers). SEE THE MAINTENANCE.